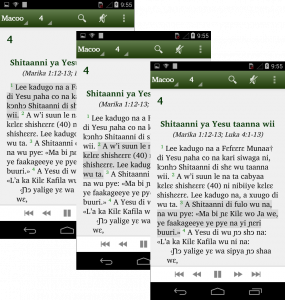 Scripture App Builder (SAB) allows you to create a complete Android app from Scripture text and audio. The finished product can then be distributed in multiple ways to users around the world so that they can engage with the Bible in their own language. With SAB the hard work of programming an Android app has been done for you. Just launch the program and follow the steps in the New App Wizard, adding Scripture and associated files. You can create a useful Android app within a few minutes without any programming. There is no need to convert your files to another format. As you continue the translation you can simply update the app with the new text. This allows for things like publishing an app for reviewers or early editions before a full Testament or even a full book is completed. The app can take full advantage of the features in the Paratext files including glossary entries, cross references and footnotes. The search feature is more robust because it is looking at the raw files. It is not hindered by the presentation format as can sometimes happen. Since these files are text they can be heavily compressed resulting in small apps. A full New Testament app can be as small as 2 MB, and a full Bible app 4.5 MB. For security, the Scripture files are encrypted so that they cannot be copied and used for other purposes. A powerful feature of Scripture App Builder is the ability to include audio with the text. An audio MP3 file can be associated with each chapter of a book. With the addition of timing files, verses or phrases can be highlighted as the audio is played. The user can control the playback by moving between verses or sections. This feature opens the app up to people who are learning to read in their language. The audio files can be included with the app or made available in other ways including directly from Faith Comes By Hearing. See the FAQ for more information. Once you have built the app, you can choose the best ways to distribute it to users. Depending on how you incorporate the audio files, the app can be used and shared completely offline. This means that it can be distributed via Bluetooth, microSD, wireless (BibleBox or LightStream), email, websites or the Google Play Store. Even if the audio files are stored online, users can still access the text immediately. Include the fonts that work best with your text, whether they are Roman or Non-Roman script, left-to-right or right-to-left. Apps can be packaged with the Grandroid font-rendering library, developed by SIL’s Non-Roman Script Initiative. You can design your own app icon and optional splash screen. The files are standard PNG images that can be created in popular photo editing software. Along with a number of color schemes, you can adjust the colors of individual items to better meet the culture of the audience. All of the app interface text can be translated and localized. The user interface in Scripture App Builder itself can be displayed in English, French or Spanish. Front matter: introductions, alphabet description, etc. You just need to use standard format markers, like \c for chapter, \p for paragraphs, \q for poetry and \s for sub-headings. As well as building smartphone apps, Scripture App Builder can create e-books in EPUB format. EPUB documents are readable by a number of e-book readers on Windows, Mac, iOS and Android platforms. If you have timing files for your audio, the e-books can contain ‘Read Aloud’ text-audio synchronization.